POLO, THE OLDEST TEAM SPORT IN THE WORLD, IS COMING TO BALLADEER’S BLOG! It will be joining all my other subjects so nothing is going away to make room for it. Polo is THE television sport and feels like you’re watching an action movie as the players exhibit their skills. Instead of “Innings” or “Quarters” or “Periods” a Polo Match is made up of “Chukkers”. There are six Chukkers to a Match. After three Chukkers comes Halftime. Each Chukker lasts 7 minutes plus up to a maximum of 30 additional seconds to complete a play in progress when the Chukker ends. There are four riders on each Polo team, wearing numbers 1-4 depending on the position they play. The field in a Polo Match is 300 yards long by 160 yards wide. 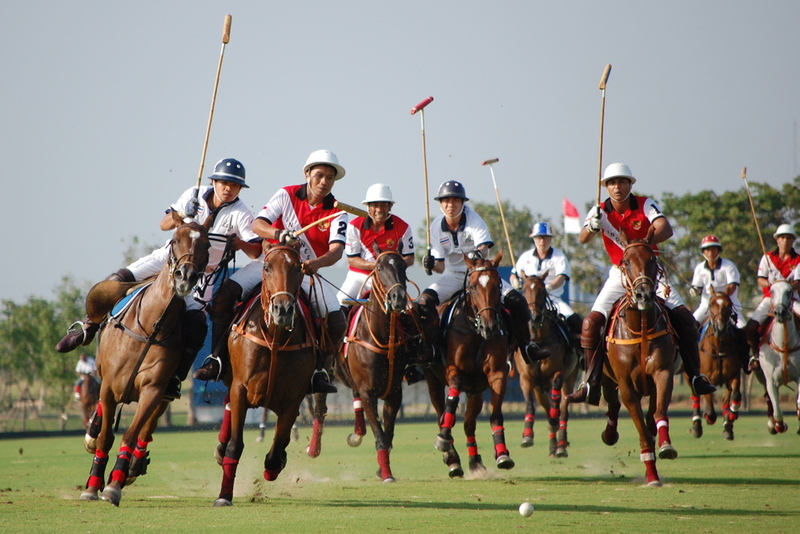 The object of the game is for the Polo players to score goals by moving the ball around the field by hitting it with their long mallets while remaining mounted at all times. A goal is scored by hitting the ball so that it passes between the two 10 feet tall uprights in the opposing team’s End Line (End Zone). As with field goals and extra points in football the uprights theoretically extend far above their actual height. The ball may pass high above the uprights but still counts as a goal as long as the official in the End Line judges it to have passed within the uprights. For some penalties a free shot is awarded to the opposing team. Depending on the severity the shots can be taken from the 60, 40, 0r 30 yard lines. 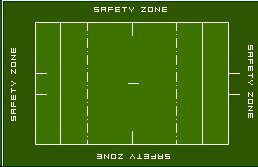 The player rides up to the ball to strike it but their horse cannot pass whichever yard line applies to that particular penalty shot. A mounted Referee tosses the ball onto the T at the center of the Polo turf to begin play, similar to “dropping the puck” in Hockey. After each goal is scored both teams return to the center of the field for another “Toss In” or “Throw In”. The team with the most goals at the end of the 6th Chukker wins. If the 6th Chukker ends in a tie the teams play a 7th Chukker with the very next goal to be scored – called the “Golden Goal” – winning the game. The 7 minute play-clock for each Chukker stops for penalties, out of bounds balls or if the officials blow the whistle for any other stoppage. There are 3-4 minutes between Chukkers and 5-1o minutes for Halftime. In real time a Polo match lasts approximately 90-100 minutes, barring excessive stoppages. Each goal is worth “1” on the Scoreboard. Scoring in Polo occurs much more frequently than in Soccer, Hockey or Baseball. Professional games generally have scores like 14-12 or 11-10, etc. College games generally have scores like 21-18 or 25-21, etc. Players wearing the numbers 1 and 2 have primarily Offensive responsibilities. Players wearing the number 3 have a combination of Offensive and Defensive responsibilities and play the most important position on the team. The “3” position is usually the best player on the team and is like a combination of a Quarterback in Football and a Short Stop in Baseball. Players wearing the number 4 have primarily Defensive responsibilities but are NOT Goalies as there are NO Goalies in Polo. The “4” position is generally reserved for the player who is the best at striking the ball backward, as in riding forward after the ball but striking it back-handed so it flies back and out of the side of the field being defended. This is similar to how Hockey defensemen are generally the best players at skating backwards. 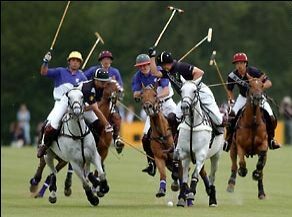 Polo is thrilling to watch as the players have to maintain control of their horses, fend off opposing players and maneuver the ball with their mallets all at the same time. 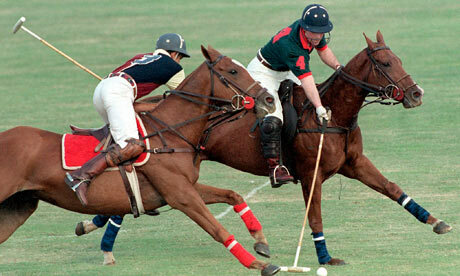 Anyone who is a fan of either hockey, soccer, golf or horse racing would probably enjoy Polo Matches. I will say again that to me Polo may be the ULTIMATE televised sport, as closeups, replays and odd angle footage let a home viewer see more than spectators at the Match get to see. 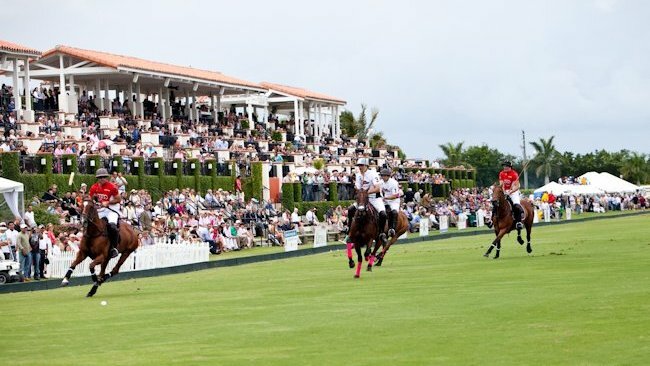 Some high-end Polo Clubs are experimenting with overhead drone cameras to crank up the excitement of the broadcasts even more. In this era of a la carte streaming broadcasts the United States Polo Association should pursue arrangements with outfits like Netflix for tightly- edited renditions of the action from various matches, leaving out the time between Chukkers and Halftime. Think of those terrific 2-hour versions of NFL or College Football games with all the extraneous elements edited out. A package of fairly recent Polo matches – each edited down to about 70 minutes – would likely draw in a lot of young fans. Polo guys look really hot! I’m in for this! Okay! Feel free to spread the word! This is good news actually especially to Polo fans. We all have a blog now to see and get updates with about the latest happenings in this sport. I am glad to know about it also because I’m really a sport’s fan! You have actually gotten me interested in Polo! I am glad to do it!